Each of these Strawberry Cheesecake Recipes will provide you with a cheesecake you are sure to enjoy. What could be better than a creamy cheesecake paired with sweet juicy strawberries? These recipes are easy to prepare for your family and friends. You can even make cheesecake using a blender. How easy is that? Choose from the recipes below and you will find the perfect dessert for any occasion. Easy Strawberry Swirl Cheesecake Recipe takes only minutes to mix. Easy Strawberry Cheesecake Pie is mixed using a blender. NY Style Recipe for Strawberry Cheesecake makes a traditional cream cheese cheesecake with a graham cracker crust. 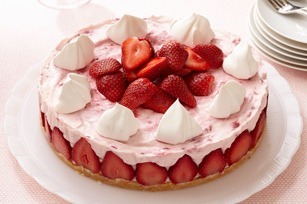 Ultimate Strawberry Cheesecake Recipe has strawberries in the filling and a fresh strawberry topping.